Find out how the adidas adiPure performs on the court. There was a time – not all that long ago – when double-lasted basketball shoes were abundant. With AND1 leading the charge, and outfitting a significant percentage of the League in the early 2000s, this construction somehow managed to be simultaneously externally sleek and internally clunky, and became commonplace on the hardwood. Aesthetically, I’ve never been a fan. I’ve always thought it made shoes look cheap. More importantly though, I’ve never (generally speaking) liked how they play. Double-lasted shoes are often very stiff out of the box, and take some extended breaking in before their transitions become acceptable. It’s a concept that makes sense on paper, but how does it translate to on-court performance? When I first tried the adiPure on, I wasn’t so sure it would be successful. The shoe initially exhibited many of the negative characteristics I normally associate with double lasted shoes, such as a clunky transition and sloppy fit. It did feel low to the ground though, and have a court feel familiar to many of the PureMotion-based adidas shoes I’ve played in recently, which I find to be excellent. Within just two or three runs, the shoe began to flex much more naturally. It was a huge improvement for such a short period of time. If you are a player that is looking for the absolute smoothest ride out there, you can definitely do much better. But if support and protection are your top priorities, the transition and court feel are exceptional for such a substantial shoe. While the transition did end up being a positive aspect of the shoe, the fit – or lack thereof – was there to stay. The shape is one that will fit anyone, but no one well. That’s obviously a generalization, and I’m sure some ballers with wide feet will be able to get a much better fit than I did. Then again, my feet are slightly on the wide side already, and these still felt too bulky. I was disappointed in the fit, because I was a big fan of the SPRINTSKIN uppers found on both the SuperBeast and Rose 1.5. I found those uppers to extremely supportive and protective, without feeling heavy or cumbersome. Without that one-to-one fit, the effectiveness of the SPRINTSKIN was hard to appreciate here. As for breathability in the upper, it’s perfectly acceptable, but not great. Thanks to that less-than-ideal fit, the overall feel of the upper is bulky. You won’t mistake this for speed-based shoes out there like the DRose signature line. What saves it though is the excellent cut of the collar. While it could have easily become an immobile, big men-only shoe, the heel notch offers excellent range of motion. So, while it’s not a sleek and fast shoe, it is commendably mobile for all of the padding and protection it offers. 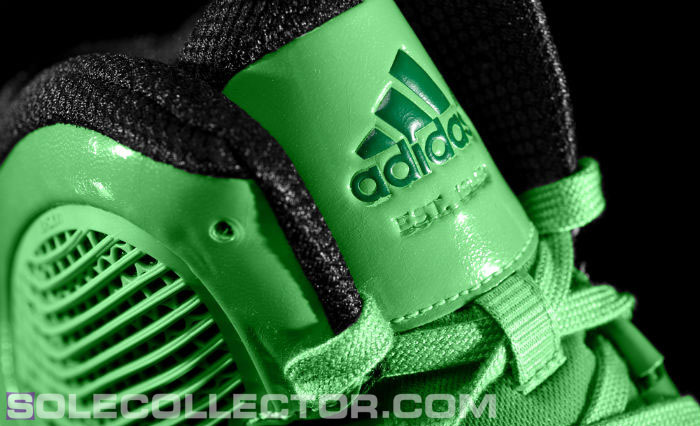 And speaking of protection, the adiPure features full-length adiPRENE+ hidden in that double-lasted midsole. “We’ve done it before but it hasn’t been full-length on our products for a while,” explains Fuller. “With the adiPure, we wanted to make sure it was full-length to give the best energy return to versatile players.” For fans of adiPRENE+, you’ll find the stable, somewhat firm cushioning you’re accustomed to, in a low-to-the-ground package. I always find that adiPRENE+ takes some breaking in before I’m able to feel a perceivable level of protection, which was the case here. Even once it’s broken in though, I didn’t find it to be as effective as the newer Alive cushioning found on the SuperBeast, or even the Crazy Light’s foam package (although the Crazy Light cushioning setup may not be supportive enough for some bigger players). If you do like adiPRENE+ however, the excellent court feel makes it a top-notch use of the cushioning. 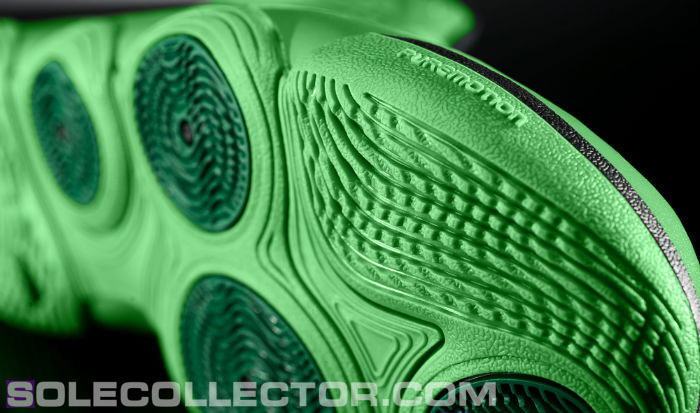 The outsole of the adiPure features the aforementioned PureMotion configuration, along with the effective Cilia Traction surface. This has been a winning combination in the past, and continues its streak here. I don’t find the traction itself to be the absolute stickiest out there (although very good), but the PureMotion configuration allows for your foot to find something to grip at much more extreme angles than your standard shoe. Between its secure traction on harsh cuts, and the close-to-the-ground court feel, the adiPure’s outsole is a standout. The adiPure is a well-rounded performer, and based on its generically shaped last, should work as a solid team shoe. But it’s hard to get excited about it when there are so many competitively priced shoes – from adidas as well as other brands – that do most of what it does, as well, if not better. And fit better on top of it. The big exception will come for players with wide feet. If you have a hard time getting finding a shoe that’s wide enough, the adiPure is definitely worth a look. It’s heavily padded upper, supportive cushioning and dynamic court feel make for a protective and surprisingly nimble ride. buying advice: As a team shoe, the adiPure offers a well-rounded and durable option, with a short break-in period. For just $10 more than the adiPure’s retail price, you can find better options from multiple brands. But, if you have wide feet, and are looking for a shoe that is impressively mobile for the protection it offers, it’s a shoe worth checking out.